In Alaska, many residents have joked for years that mosquito is the state bird – referring both to the size of the insect as well as its prevalence. Climate change could make that much less of a joke, though. A new study from Dartmouth College Dickey Center’s Institute of Arctic Studies suggests that warming temperatures in the Arctic are having a profound effect on mosquito populations, causing them to emerge earlier and grow faster, leading to an increased threat to the caribou they feed upon. It’s no secret or surprise that global temperatures are rising, but most people probably don’t know that climate change has hit the Arctic even harder than the rest of the globe. There, average temperatures have increased at twice the global rate in the past 100 years. Because of the low biodiversity in the region, the predator-prey relationships are extremely vulnerable to the effects of climate change, and the Dartmouth study reveals what kind of dramatic impact the rising temperatures are having on these tiny blood-sucking insects. Essentially, the study found that warmer temperatures have caused the mosquitoes to emerge two weeks early and also shortened their development time through the larval and pupal stages by about 10 percent for every 1°C increase in temperature. Diving beetles are the primary predators of the mosquito in the Arctic, and the increased mosquito population did correlate to an increase in number of blood-suckers being eaten by the beetles, but because the insects are now developing more rapidly, they spend less time being exposed to predators in the vulnerable juvenile stages of life. This leads to an increased chance of survival into adulthood, translating into a larger mosquito population. A 2°C warming scenario, according to the research model, predicts that mosquitoes’ survival rates will increase as much as 53 percent, substantially disrupting the food chain. The study was published in the journal Proceedings of the Royal Society B: Biological Sciences. Arctic mosquitoes are emerging earlier and growing faster due to climate change. Dartmouth College research shows a link between climate change and growing mosquito populations. 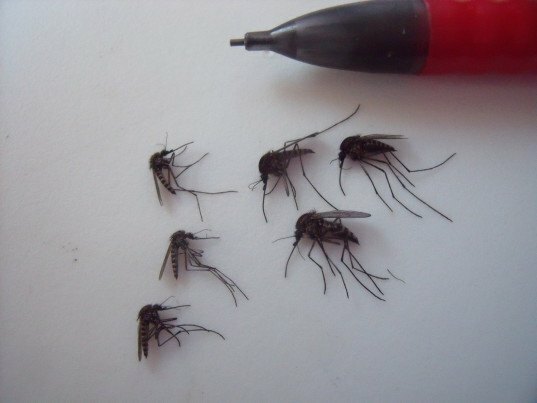 Arctic mosquito populations are booming due to climate change.